Like I said last week, October went by fast. That’s partly because it was a busy month, but also because of our beloved Inktober and Drawlloween events! Last year was a cluster because I blindly ran through both lists without much care or concern – and it shows. When I fell behind it was double the drawing and all I cared about was doing something, anything, to get it done. That was kind of the point for me last year anyway. I just wanted to see if I could do it. Obviously I did (poorly), so let’s move on to this year. Some of the last few days of Inktober/Drawlloween! It was better! Mostly because I combined the two lists. It made some days fun, some days less-than-fun, some days challenging, and some days two out of the three. So that kept me to one drawing per day – much more manageable for the times I when I inevitably fell behind by a couple of days. I also stuck to black ink only so I could focus on the subject and not get all distracted by bright flashy colors. You’d think that being an artist means you’re amazing with color palettes, but that’s simply not the case with all of us. I’m a limited palette type of gal and I’ve learned to accept that! This is what my Insta doesn’t show… what a waste of space! 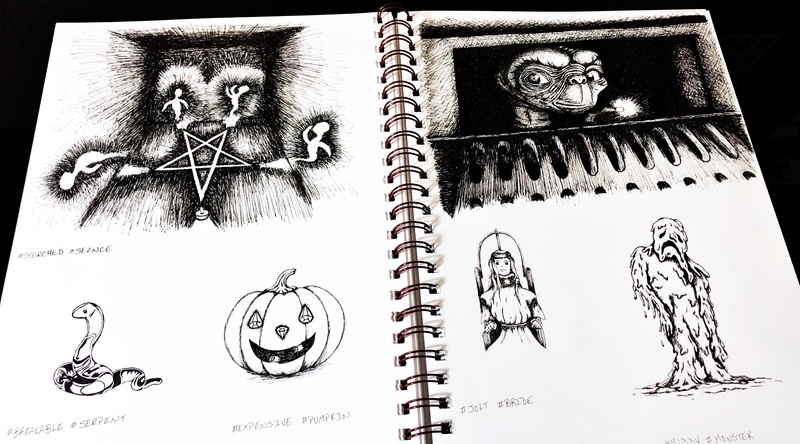 One thing that I said I would do this year that I didn’t do last year and still didn’t do this year was do all of my sketches in my designated Inktober/Drawlloween sketchbook. I didn’t want to have all the sterile white space in between my drawings. Well, it pretty much happened anyway, but not as bad. 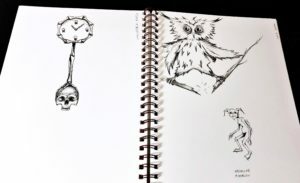 If I wasn’t sure about what I wanted to draw or how it should look, I did some sketches in my dreaded “If I Die, Burn This Sketchbook without Ever Looking in it” sketchbook. You know, the one I started posting pics from on my sketchbook page? I also had a little sketchbook I carried around to try ideas in when life had me waiting in places like the doctor’s office. So some of the “final” Inktober drawings have previous sketches and some don’t, but I did make an effort to use up as much of the page as possible. I feel like that got really boring right there. Did that get boring right there? It’s the fourth paragraph and I’m only now getting to my point. Sorry! Please enjoy this unicorn doing the apology dance. If there’s one thing that combining the Inktober and Drawlloween lists did, it’s that it forced me to think about what I was drawing more carefully. I didn’t want to be too obvious (although on some days I think I was), but I didn’t want to have to explain what the drawing was beyond simply stating the prompts. There was a little research involved on some of these and I learned some pretty cool random facts! Day one’s prompts were poisonous and witch. I wanted the witch to be holding some sort of poisonous creature, but I wanted it to be more mythical-looking than real. So I started to wonder what makes something look poisonous? Bright colors was the first thing that came to mind, but what else? Then the good old internet taught me the difference between poisonous and venomous. Yes, both types will poison you, but the difference is in the delivery of the toxin. Venomous animals bite, scratch, or sting – it’s an active method of delivery. 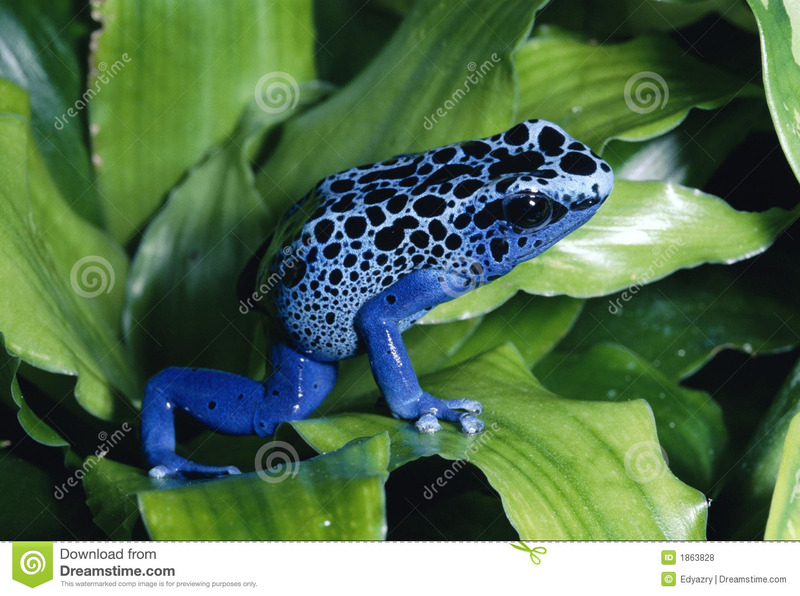 Poisonous animals (like dart frogs) have a passive delivery – you have to touch them to be poisoned. There’s more to it than that, but we don’t have all day here! I tried making up my own creature, failed miserably, and drew a plant. Day three was roasted and cryptid. There are more types of cryptids than you can shake a stick at! And if even a couple of them turned out to be real, you probably wouldn’t want to stand there and shake a stick at them. I went with a Cuchivilu, which has the front half of a pig and the back half of a serpent and lives in the water. In Chile, the Cuchivilu would destroy fisherman’s nets, eat their catch, then curse the water so no more fish would be caught there. Turns out that Cuchivilu are elephants seals. Neat! What I really wanted to draw was a Dobhar-chú, which is this giant Irish dog-otter creature, but I couldn’t bring myself to draw it roasted. I also learned about different types of Yokai, baby owls are alarmingly cute, frogs are way more popular than toads, and that I’m not the only kid that was a little bit scarred by the Secret of NIMH. I’m sad it’s over, but I’m glad to go back to my own stuff. There’s only a little time to art every day and my kid commissioned a drawing of One Punch Man. I have to get to work! Thanks for reading! 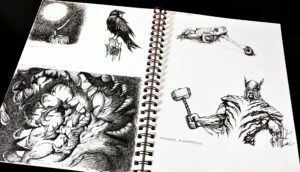 All of my sketches and drawings from this year’s Inktober and Drawlloween can be found here. Until next time!